Dr. Jean-Jacques Edderai has studied extensively, all over the world. In fact, rarely has a dentist been trained so thoroughly as Dr. Edderai. Having grown up in France, Venezuela and Israel, Miami dentist Dr. Edderai is comfortable and fluent in French, Spanish, Hebrew and of course English. After attending the Montefiore Academy in London, he went to Israel to study radiology with some of the leading doctors and professors in the field, at Tel-Aviv University. Upon graduation, Dr. Edderai became chief of the children cardiac catherization lab at Military Hospital (Fundacardin) in Caracas, Venezuala. While there was much professional and personal satisfaction in this position, Dr. Edderai felt that he had more to offer the medical field. He relocated to Miami to perfect his English at the University of Miami and then to New York to study psychology at Queens College. His studies then took him to his true calling: dentistry. Dr. Edderai attended the prestigious Dominican Dental University where he graduated and then moved back to Miami to begin his career. Practicing and perfecting dentistry has become the focus of his professional career and studies. Dr. Edderai is trained in general dentistry, dental implants, dental surgery, orthodontics (including Invisalign), endodontics, TMJ disorder and periodontics. He is trained in electromyography, electrognathography, joint vibration analysis, othogantic repositioning treatment and myofunctional therapy. Additionally, he has twice completed a training program at the Tampa Bay Craniofacial Center and has completed the two-year training program at the United States Dental Institute. Dr. Edderai also gives back to his profession and to his community. He has volunteered for over 20 years to work once a month in the free dental clinic at Lindsey Hopkins Dental Research Clinic. He is also eligible to become a Fellow of the Academy of General Dentistry and has been an examiner for the Florida Dental Board. With all these accomplishments, it’s hard to imagine that he has time for anything else. However, Dr. Edderai finds time to be one a devoted husband and father of three beautiful children and grandchildren’s. The same dedication and uncompromising commitment that Dr. Edderai demands of himself, he brings to every one of his patients….without exception. 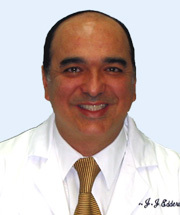 Dr. Jean Jack Edderai Dentist serves the communities of Miami, Miami Beach, Surfside , Bay Harbor, North Miami Beach, Aventura, Hollywood, and Ft. Lauderdale.